One of the most frustrating problems of the measurement and control industry is that of the ground loop. Its effects can appear and disappear with no apparent reason and can range from mere annoyance to downright destructive. It seems that ground loops carry some mystical connotation to the point that our industry has made it a “catch all” culprit for anything that cannot be explained. While ground loops can be complex problems and may not always be predictable they can be understood and dealt with if we have a little insight into just what they are and how they can affect a transmitted signal. Let us first refer to Figure 1. This Figure depicts what we might consider to be a typical measurement loop. It has a transmitter sending a signal to a receiver, some finite distance away, over a pair of wires. One side of the signal current has become grounded via internal circuitry and ultimately is tied to earth ground usually via the instrument case. As depicted in Figure 1, this measurement loop would probably work fine and not have any influence from ground loop currents. However, reality sets in and we have to abide by plant safety procedures, the National Electric Code, etc. Safety procedures almost always will mandate that each piece of equipment be grounded to earth at its respective installed location. This is where the trouble starts. Once we ground two pieces of equipment at two different locations we have set the stage for ground loop problems. If we could take a volt meter (Figure 2) with very long leads and measure the voltage between the ground points of the transmitter and the receiver we would measure some voltage. It may measure in millivolts or it could be many volts. Either way, if there is a potential difference, then current will flow between these two points. Since the earth presents itself as a resistor between these two ground points the amount of current that flows between the points will be directly proportional to the voltage difference and inversely proportional to the resistance. For those who are fans of Ohms Law you will recognize this equated as I=E/R. I being the ground current; E being the voltage between the ground points; and R being the resistance of the earth between the two ground points. Figure 3 shows that we now have two currents that can flow through the wiring between the transmitter and receiver. If it all stopped here we could just calibrate the measurement loop to nullify the effects of the ground current and go on about our business. Many times this is exactly what happens. A technician calibrates the loop and comes back a few days later to find that his calibration is no longer accurate. What has happened? It could be a lot of things. Maybe it rained and the resistance of the earth changed. Suffice it to say there are many phenomenons, either natural or man-made, that can change the resistance or the voltage between the two ground points thus effecting the calibration of the loop. It is apparent that we are “fighting a losing battle” thinking we can anticipate the interactive affect of ground loop currents on our measurement loop. What can we do to get around this problem? The answer is to provide DC isolation between each component in our loop. (Figure 4) DC isolation can be accomplished either in the transmitter, the receiver, or with a third component as shown in Figure 4. Figure 4 shows DC isolation being accomplished by using a transformer. An isolator module, of course, is much more than just a transformer, but it is the transformer component in a signal isolator that, in fact, provides the isolation since DC cannot pass through a transformer. Now that we have inserted this “transformer” into the circuit, the ground loop between the transmitter and the receiver no longer exists, thus eliminating its effects on the signal current. The Wilkerson product line provides several options for implementing DC isolation depending on how the isolator is powered. There are three basic ways of powering an isolator. Signal conditioning equipment for process signals has kept pace with modern technology, but many users never realize the full potential of the equipment because of poor installation and wiring practices. Such practices can degrade equipment performance from a small percentage of error to the point where the equipment is unusable. The most common complaints heard by this company are invariably associated with wiring problems. The most common problem encountered is an installation where all wiring is pulled in a common conduit or cable trough. A relay coil being switched or a relay contact switching an inductive load can easily generate a transient in excess of 1000 volts. This transient can easily couple into a signal conditioner and cause severe measurement problems. Many products have input signal levels as low as 5 millivolts full scale and an output of 10 volts. With a gain of 2000, it is easy to understand the necessity of using good installation and wiring practices. Accurate signal measurement and conditioning is vital if one is to maintain quality in their process control. Understanding the correct way to install and wire this important equipment is the proper responsibility of anyone who specifies control panels, wiring installations, or who manages factory personnel who install such equipment. Ground Loop – A ground loop exists whenever an extraneous current flows in a conductor carrying the desired signal. If the extraneous current is related to the power mains, it generally manifests itself as “noise”. If the extraneous current is DC, it can create an offset that can be difficult to recognize. The measured signal becomes the sum of the signal and ground loop current. Magnetic Coupling – AC currents can be induced into the conductors carrying the desired signal. The AC can be power mains, magnetic transients from switching inductive loads, or magnetic fields from coils, transformers, or motors. Capacitive Coupling – AC voltages can be capacitively coupled to the signal carrying conductors. This is accomplished by locating the signal leads near an AC voltage source such as power mains, SCR drive inputs or outputs, or any other source of AC potential. Radio Interference – Radiation from radio transmitters can create measurement problems by having some portion of the signal conditioning circuit rectify the radio energy and adding the resultant DC to the process signal. The radio energy source can be a portable two-way radio or a fixed installation radio or television transmitter. The interference can be momentary with portable radio equipment or a permanent offset with fixed installations. AM radio transmitters can often modulate the process signal with the voice or music modulation on the radio carrier. Lightning – Lightning interference is sporadic and the primary concern is for survival of the equipment. Central Florida in the United States has the most frequent and intense lightning storms in the country. It is nicknamed the ”lightning belt”. Survival is the desire in this environment. The location of signal conditioning equipment is important for the prevention of the common problems defined above. Avoid mounting equipment next to high voltage sources such as breakers, fuse blocks, or terminal strips. Also avoid magnetic field sources such as large transformers, motor control relays, or motors. Wiring paths should also be considered when mounting equipment. Insure paths exist to route signal wires without having to run them in proximity to noise sources. 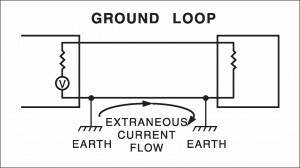 Ground Loop Avoidance – Avoiding a ground loop is simple. Never let an extraneous current flow in the signal leads. If a device must drive two or more loads with a voltage signal, use individual leads from the output to the input of each driven device. When the driven device and the driver must both connect to earth ground, use an isolator to break the ground path for extraneous currents. Every effort should be made to keep signal leads away from AC magnetic field sources such as motors, transformers, or large relays. If it is necessary to route signal wiring near these devices, use a twisted pair of conductors for each signal. A pair of conductors with ten to twelve twists per foot offers an effective method of reducing magnetic pickup. 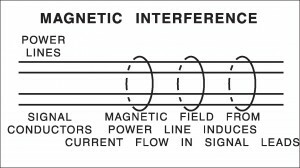 A major source of magnetic interference is created by running untwisted signal leads parallel to and in proximity to conductors carrying AC currents. Twisting the signal leads and the power leads are an effective way to reduce this form of magnetic interference. Mounting signal conditioning equipment in powerful magnetic fields can create interference inside the circuit boards and internally in the integrated circuits used in the equipment. The most reasonable and effective cure for this condition is to move the equipment away from the magnetic field. AC potentials near signal carrying conductors can capacitively couple the AC to the signal conductors. The higher the frequency of the AC source the more extreme the potential interference problem. Common sources of interference are SCR drives, relay coil circuits, welders, and fluorescent lamp conductors. If the interference cannot be avoided by equipment location and wire paths, shielded wire should be used between products. Twisted shielded wire is the best choice because the twist provides magnetic interference protection and the shield prevents capacitive coupled interference. The shield should be connected to the circuit common of the driven device. It should never be connected to both devices. Current could flow in the shield and magnetically couple to the signal leads. If the signal conditioner is mounted near a high potential source, capacitively coupled interference can occur by direct coupling to components inside the product. Metal housed products can be effective in preventing direct coupling, but the preferred practice is to locate the equipment in a better environment. Well designed products will include internal filters to desensitize the product to radio frequency signals. There is no cure for direct radiation pickup by components in the product except extensive shielding. Metal housings with RFI gaskets can be used to shield the product. If the RFI source is powerful enough, individual RFI filters may be required on each conductor entering the metal housing. 1. Mount all equipment in a metal housing. 2. All signal leads should have a gas discharge transient protector to circuit common. 3. Circuit common should have a gas discharge transient protector to a good earth connection (very short heavy lead). 4. Power connections should have a transient protector from each line to earth. 5. Use twisted shielded pair for all signal leads. 6. Run all wire underground where feasible – otherwise use metal conduit which is well grounded. 1. Never run signal leads in the same conduit or bundle that carries power mains, relay coil drive, relay contact leads, or other high level voltages or currents. 2. Never connect the shield of a shielded wire to anything other than the circuit common of the input of the product being driven by a signal.